Shirts With Random Triangles: Les Miles will NOT be Michigan's next head coach. 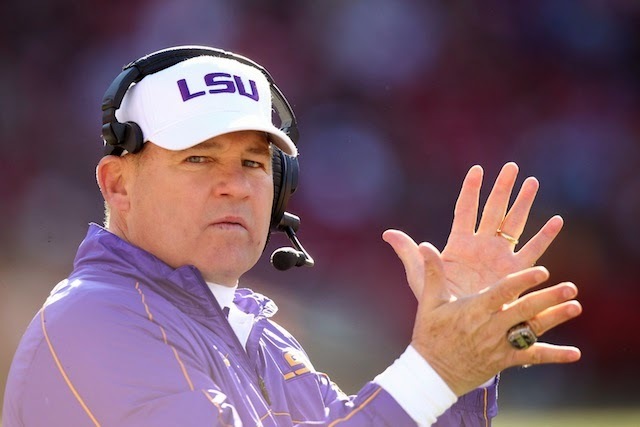 You can add Les Miles to the list of people who won't be coaching Michigan. The Mad Hatter told reporters on Monday night that he has no plans to leave LSU to become head coach at his alma mater Michigan. The LSU head coach said that neither he nor his agent George Bass, have even been contacted by Michigan to replace the fired Brady Hoke. Miles says he is focusing on the Tigers' 2014 Music City Bowl opponent Notre Dame. The schools will meet on Dec. 30.